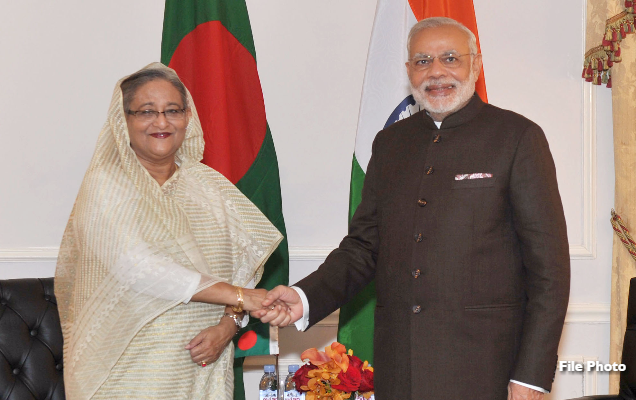 During her forthcoming visit to West Bengal when she meets Indian Prime Minister Narendra Modi, Bangladesh Prime Minister Sheikh Hasina is likely to raise the developments in Assam. Her close advisers are uncertain about the fall out of the NRC update in Assam and have advised her to seek Modi’s assurance that there would be no attempted deportation. “It is India’s internal issue and we have no reason to sound intrusive but we need to be assured on certain issues,” said a top Awami League leader but he insisted on anonymity. Assam Chief Minister Sarbananda Sonowal‘s statement that the NRC update and other related issues would not impact on the State’s relations with Bangladesh has, however, soothed ruffled nerves in Dhaka. The agitation on the Citizenship (Amendment) Bill, 2016 has also been well received across the border because all parties in Bangladesh are uncomfortable with the bill as it discriminates on religious grounds over citizenship. The Awami League specially is uncomfortable with this bill because it may encourage Hindu migration from the country and lead to erosion of a safe vote bank for the party. Bangladesh goes to polls end of this year and Hasina cannot afford any border tension with India. In 2001, the border clashes at Pyrdwah and Boroibari adversely affected her chances and her party lost the elections. It is no secret that Hasina is seen as soft on India and any tension in an election year only benefit her adversaries. By all counts, this will be a very tough election for her and she us taking no chances. The post poll developments in the southern state of Karnataka have also possibly unnerved Hasina. After Prime Minister Modi’ s fusillade on the ‘murder of democracy ‘ in West Bengal following the large scale violence during the recent Panchayat elections, Mamata Banerjee had good reasons to believe she would be next in the line of saffron fire if Karnataka went the BJP’s way. She has been apprehensive since the BJP’s upset victory in the Bengali majority Tripura. BJP insiders say a key reason for Modi to pile pressure on Mamata was to soften her stance on Teesta and elicit a ‘positive’ statement from her on the issue. Now that Karnataka has not gone BJP’s way and Mamata is likely to rush to Bangalore to attend Kumaraswamy’s swearing in to rub salt into saffron wounds, it has become uncertain what stance she would adopt on Teesta during the Hasina visit. It is also not certain whether Mamata would attend Hasina’s day one programme at Viswabharati University in Shantiniketan where Modi will join her. She has sent a sealed letter to Hasina through the Bangladesh Deputy High Commission in Calcutta, the contents of which is anybody’s guess. By now Hasina is aware of it but has not spoken about it. So is this good or bad news for her is anybody’s guess. Some Trinamul insiders suggest Mamata could be politely excusing herself for her intended absence from the Shantiniketan event and setting up an evening with Hasina who she addresses as Apa or elder sister. Mamata under persistent prodding from External Affairs Minister Sushma Swaraj had appeared ‘softer than before’ on Teesta in recent weeks but after Karnataka that becomes a grey area. However, it could well be she avoids meeting Hasina in Modi’s presence and then join her on Day two when the Bangladesh Prime Minister is conferred a honorary D Litt at Kazi Nazrul Islam University. And since Modi would not be around during that event, Mamata may choose the occasion to make a positive statement on Teesta. If she does that, she could steal the thunder on Teesta from Modi because she is a Bengali leader who could connect more easily to Bangladesh masses than Modi. Mamata’ s image has also been badly affected by the Panchayat poll violence that left nearly 30 dead and a positive step on resolving Teesta may help her somewhat overcome that and project her as a national leader which she is trying hard anyway to emerge as a Prime Minister aspirant. But Mamata is less than predictable and she would keep Bangladesh and her leaders guessing until the last moment.